TIFFIN, OHIO – February 23, 2019 – The downtown retailers and Main Street Marketing Committee released the upcoming schedule for downtown Third Thursdays. They will begin on March 21 and continue every month through the end of 2019. Following a successful test run in 2018, community members, local businesses and restaurants have partnered to again bring themed evenings to Downtown Tiffin through Third Thursdays. Every third Thursday will have a theme, and participating businesses and restaurants will have special hours and are encouraged to incorporate the theme through decorations, a special menu item, crafts, music and more. Any downtown business or organization may participate. Similar events have occurred for many years throughout the United States, but these events let Tiffin bring its own spin on the monthly events. The first two Third Thursdays for 2019 are March 21, St. Patrick’s Day Shenanigans with Clover Club as the featured restaurant, and April 18, Blooming Artist Stroll, featuring artists and musicians in downtown businesses. “These events allow Tiffin to showcase some of our great businesses and restaurants for people who maybe haven’t been downtown in a while,” said Susan Wilkinson, Chair of the Downtown Marketing Committee and owner of Simply Susan’s. For the latest news on Third Thursdays and other upcoming events in the downtown, follow Downtown Tiffin on Facebook or visit Tiffin-Seneca Economic Partnership’s website for more details, tiffinseneca.com. If your business, group or organization would like to participate or volunteer, contact Wilkinson at (419) 934-0254. Downtown Tiffin is an award-winning and state and nationally accredited Main Street program managed by the Tiffin-Seneca Economic Partnership and driven by volunteer business and community leaders and stakeholders passionate to make downtown Tiffin a destination. More than 50 volunteers participate in various committees. Since 2014, more than 40 new businesses have opened, and more than 65 downtown building facades have been improved. Since 2016, more than $25 million has been invested. Downtown Tiffin was presented with three awards by Heritage Ohio at their Annual Preservation and Revitalization Awards Ceremony held Tuesday night at the historic Allen Theater in downtown Cleveland Tuesday, October 23, 2018. Tiffin building owners have a new reason to love their city, the Facade Enhancement Program. Through this program, the city reimburses 50% of the costs of a project related to the facade of a building within the Architectural Board of Review district, up to $10,000. In its first four years, more than 60 buildings have utilized the program. The Facade Enhancement Grant Program has seen more than $2.2 million reinvested in downtown Tiffin. The Best Public/Private Partnership Award was created to recognize partnerships between organizations and government, which leverage resources to create a positive lasting impact. Tiffin-Seneca Economic Partnership Downtown Main Street Manager Amy Reinhart and Tiffin City Councilman Tyler Shuff accepted the award. Suzie Reineke and Weston Reinbolt have purchased and rehabilitated four historic buildings, which now house 12 lofts and six storefronts in downtown Tiffin. Reineke and Reinbolt prioritize working with local businesses and contractors to further stimulate the local economy. The Young Preservation Leader Award was created to recognize individuals under 40 that have shown outstanding leadership in revitalizing and preserving Ohio communities. Heritage Ohio’s independent award selection committee was quick to recognize Reineke and Reinbolt. Suzie’s father, Bill Reineke, accepted the award on Suzie and Westons’ behalf. Amy initiated a relationship with Heritage Ohio as soon as she started working for the Seneca Industrial and Economic Development Corporation (now Tiffin-Seneca Economic Partnership) back in June of 2014, as she ushered the program through the process of becoming a certified Main Street in 2015. Trained as an architect taking on the implementation of Tiffin’s Facade Enhancement Program was a natural. Under her direction, Tiffin has seen 36 new businesses open in the downtown area. Amy began with eight dedicated volunteers, now more than 50 people have joined the downtown committees. She keeps the big picture in mind while implementing the vision of Tiffin’s strategic plans, while attending to the tiniest of details of their many events. Her contributions to the city of Tiffin have been invaluable. The Main Street Director of the Year Award was created to celebrate Ohio Main Street executive directors who clearly excel in the services they provide their communities. Heritage Ohio’s independent award selection committee recognized Reinhart’s impact on the Tiffin community. As Ohio’s official historic preservation and Main Street organization, Heritage Ohio fosters economic development and sustainability through preservation of historic buildings, revitalization of downtowns and neighborhood commercial districts, and promotion of local tourism. Learn more by visiting www.heritageohio.org. 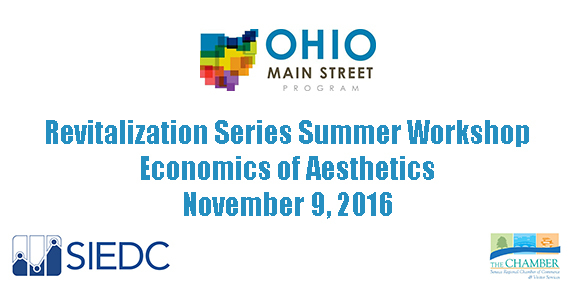 As a newly minted Main Street Community, Tiffin will be hosting its first Heritage Ohio Workshop: The Economics of Aesthetics on Nov. 9. The workshop is part of the Heritage Ohio Revitalization Series and will feature speakers presenting on the importance of creating memorable, attractive and pedestrian friendly places and how to go about creating such places. Topics will include fostering high quality private investment, creating walkable places, and increasing community engagement. The workshop will conclude with an afternoon placemaking activity facilitated by DS Architects, in which attendees will walk the downtown and reconvene with placemaking ideas specific to the town. The event will be held on the second floor of the Tiffin Knights of Columbus and is open to all Tiffin community members. Click here to register (select the Main Street Community option) or learn more. The Heritage Ohio Revitalization Series is a quarterly workshop covering each of the Main Street Four Points during the course of a year. The series features expert presenters from Ohio and beyond discussing such topics as fundraising, volunteer management, bikeability, special events, marketing, real estate, business development and much more. Each workshop is held in a different Ohio Main Street Community and will benefit anyone working in community development or downtown revitalization. T IFFIN, OHIO – February 19, 2016 – New wayfinding signage is being installed in downtown Tiffin today. The signs are part of a two-phase project to help visitors and residents more easily find their way to attractions and parking in downtown Tiffin. The new wayfinding signs finish phase one of the project, which also includes the kiosk on Courthouse Square listing downtown attractions. A second phase of the project is scheduled later this year and includes kiosks on the Tiffin and Heidelberg University campuses as well as signage for all city parking lots downtown. The total investment for both phases is around $100,000. Tiffin Mayor Aaron Montz is pleased to see the signage go up. “I appreciate the work of SIEDC and the Main Street committees in making this happen. It continues our strategic effort to make downtown Tiffin a destination place and easy to navigate for visitors and residents alike.” The initiative is one targeted in the Downtown Strategic Plan adopted by the City in 2010, and one the Main Street Design Committee has been working on this effort for more than a year. The Seneca County Commissioners have also approved parking lot signage to match the city signs and are in the process of implementing signage in four lots. After both phases are completed, 39 obsolete signs will be removed from downtown streets. TIFFIN, OHIO – January 2, 2016 – The Seneca Industrial and Economic Development Corporation would like to invite the community to celebrate Tiffin’s new status as a Heritage Ohio Main Street Community at the Knights of Columbus, 49 E. Perry St., on Thursday, Jan. 14, 6:30-9:00 p.m. The event will feature speaker Craig Krenzel, former OSU quarterback, 2002 National Championship winner and two-time Fiesta Bowl MVP. He will talk about teamwork in community development. Heritage Ohio Executive Director Joyce Barrett and Director of Revitalization Jeff Siegler will also be in attendance. Entertainment will be provided by local classic rock band MOJO. Food and beverages will be provided by local businesses, including Buffalo Wild Wings, Jolly’s Drive-In, Reino’s, The Empire at 138, Bailiwicks and Madison Street Tavern. If you would like to attend, please RSVP to Bryce Riggs at riggs@senecacounty.org or 419.889.3932. Main Street is a comprehensive revitalization program that promotes historic and economic redevelopment of traditional business districts. Established in 1997, the Heritage Ohio Main Street Program is dedicated to empowering each community within the state to maintain, strengthen and revitalize the unique physical, economic, historical and cultural characteristics of its own Downtown, Urban Neighborhood District or Village center.